I realized I haven’t been shooting much lately when I opened my Lightroom to work on my next photo and saw that aside from a gazillion photos of Damon (my son) there just wasn’t much I wanted to post. Like most new fathers, we’re showing our kids to everyone we meet and I figured that most of the readers of my blog would soon ban my blog if I started posting all the baby photos I have. But I decided that I would go through some old archives and look around for some of my old shots to see if there was something I could work on and use. 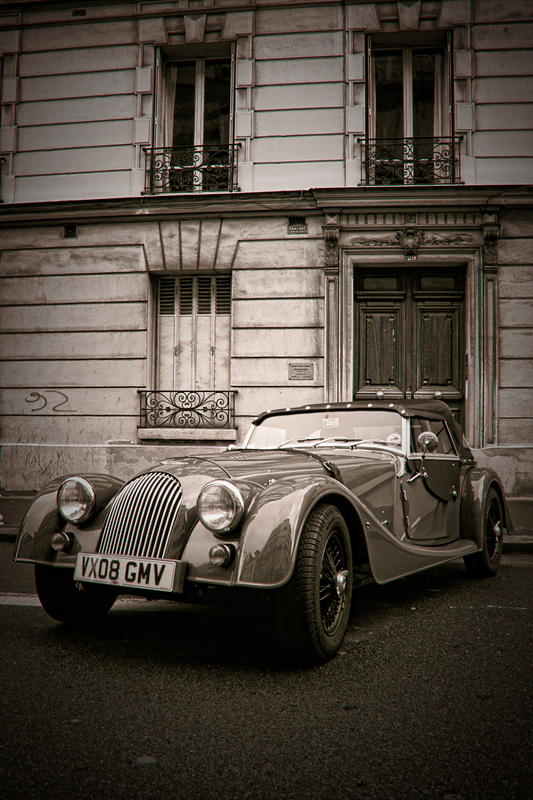 I found this photo of an old car in Paris suburb called Montrouge. If I am not mistaken this is a Morgan +4, a pretty photogenic car from the 60s. The photo was taken in May 2009 with my first DSLR which was a Canon 500D at a car show they were doing in the city. The street was lined with Ferraris and lots of other great cars. I shot quite a few of them but they just didn’t turn out that great due to the background which didn’t really look that good with a Ferrari but on the other hand fits well with an old car like this. Well this little experience made me realize how much I need to start going to shoot again, however, taking care of my son has stepped up on the priority list and I think nobody will be upset about that. About the photo: It’s not an HDR, I post-processed it in Lightroom and de-saturated it quite a lot, then took it over to Topaz and enhanced the details a bit to give it a more grainy look and voila. A car is only as photogenic as the background makes it, so look at what you have behind and find the right car or background for yours. A car meetup can be a great opportunity but remember the backgrounds. 17 Jul	This entry was published on July 17, 2011 at 10:11 pm. It’s filed under black and white, Canon 500D, misc, non-HDR, Paris, photography and tagged black and white, Canon 500D, car, morgan, morgan +4, non-HDR, Paris, photography. Bookmark the permalink. Follow any comments here with the RSS feed for this post.